HONG KONG: Competition from Shanghai will not hurt Hong Kong Disneyland (HKDL), according to its largest stakeholder, the special administrative region's government. With the rapid development of the economy, "our country is big enough to have two Disneyland parks or more," said Secretary for Commerce and Economic Development Rita Lau Ng Wai-lan. 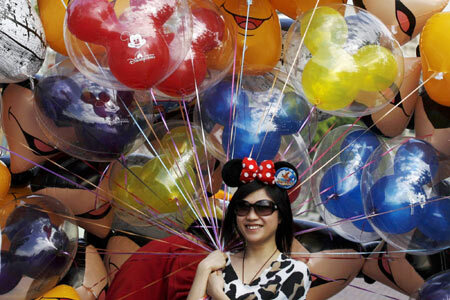 HKDL's annual attendance, from 2005 to 2008, was 4.5 million, far less than the hoped for 5.6 million. Meanwhile, rival theme parks are under development, including a Universal Studio in Singapore. Andrew Kam, managing director of Hong Kong Disneyland Resort, said in a statement yesterday that the company's commitment to Hong Kong is evidenced by the enlargement plan it announced in July. "We at HKDL are focused on getting our exciting project under way as soon as possible," he said. Joseph Tung Yao-chung, executive of the Travel Industry Council, said competition from the new Shanghai Disneyland is "benign" because it will speed up HKDL's expansion. He expects people in eastern China will go to the Shanghai Disneyland, while HKDL will mainly attract people from southern China.